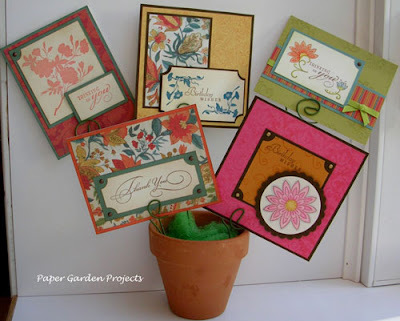 I thought today I would introduce you to the Warm Elegant Impressions card kit. All of the cards here were made with the kit with tons of supplies left over to make more! The kit contains 10 cards and envelopes (2 square) a patterned paper pack, 6 different cardstocks and embellishments - plus pictures of samples to get you started. All the cards here use only 2 stamp sets, Lizzie Anne Designs Jolie's Fleurs and Inkadinkado Nature and Floral Stamp set ( LOVE the font for the sayings in this set). 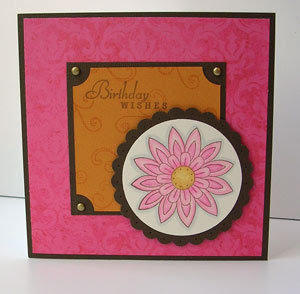 Here is a close-up of one of the cards made with the Lizzy Anne stamp set. I think this is a very happy color combination. The pink is one of the patterned papers. I stamped the Cheddar square with versamark using one of the swirls in the stamp set, clipped the corners and mounted them on a brown square. Then I added the sentiment in Versafine Vintage Sepia, mounted it and added the brads to 3 corners. The flower is stamped and colored with Prismacolor pencils and odorless mineral spirits. I paper pierced each scallop bump and mounted to the card front with foam tape. And there you go! I love Versafine ink. It is so easy to work with, the pad inks evenly and the ink is very opaque. Its my "go-to" ink usually - especially if I want to stamp on darker cardstocks or ones with a little texture. It really shows up. It is also wonderful for watercoloring or using water based markers because it is oil based. It repels water on the inked lines so the image stays darker when you go over it with water based products. But - this ink is not compatible with Copic markers. The alcohol in the markers will dissolve it and make it smear. Also, if you use it with odorless mineral spirits, it needs to be fully dry - you may want to hit it with your hear gun first. Speaking of inks - don't forget to leave a comment on this post about your favorite inks for a chance to win a free stamp. Fabulous cards, Catherine! They're all so pretty!